Sinopia is proud to introduce our first Artist of the Month: Alice Scott Crittenden. 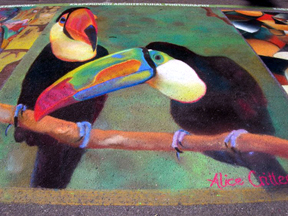 Alice has been working with pastels for over 30 years. 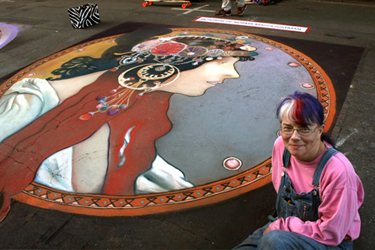 In 1998 she began street painting at the original United States Chalk Festival - I Madonnari, in Santa Barbara, CA. This event proved to be quite enlightening. 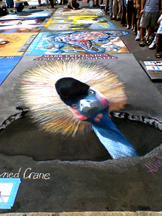 Since then Alice has participated in many Chalk Festivals in the United States and abroad. Alice says that: "The enthusiasm, and intensity I experience within myself as well as from the onlookers is stimulating. 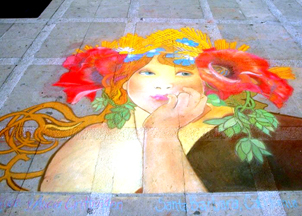 I enjoy the interaction with the viewers as they struggle to understand the impermanence of chalking on the street. The ephemeral quality, the extravagant use of color, the artist's physical ability, how children respond to the process; all are a part of the "Performance Art" experience, Street Art is a beautiful way to bring the artist's studio to the public, Observers are exposed to art in process and the finished pieces". Painting on a large scale spawned a new discovery: "I began making larger size pastels for use in my street painting. The average size stick is difficult to use on asphalt or concrete without the stick breaking or rubbing your fingers into the surface. Also, the standard box of pastels used for chalk festivals are 48 sticks. When I want to cover an area with a specific color, my 3" x 2" x 1,5" is easier to put down, and handmade colors fill the specific color void". To make a really intense dark violet: Aubergine-Violet. Just by itself is beautiful, and when I add a phthalo blue ... WOW! Quinacridone magenta is fantastic for deep red-violet colors. Well worth the cost from Sinopia for the amount I can make. When I need a great deep flesh tone, the Caput Mortuum Reddish Dark is my choice. Alice came up with the Street Chalk Recipe in our Sinopia Recipes collection.